Reza Pahlavi, speaking at an event hosted by the Center for Political Thought & Leadership at Arizona State University in Tempe, Arizona. Picture by Gage Skidmore [CC BY-SA 2.0], via Wikimedia Commons. Four decades ago, on January 16th 1979, the last Shah of Iran left the country to the jubilation of millions of Iranians and the amazement of the world. Unnerved by massive protests, Mohammad Reza Pahlavi had lost the will to fight for his crown and country. Two weeks later, the charismatic leader of the revolution, Ayatollah Khomeini returned to Iran in triumph and embarked upon establishing his Islamic government. And yet, as the 40th anniversary of the 1979 revolution approaches, a spectre is haunting Iran, a spectre of monarchism. Iran’s 2017 nationwide protests had some unique features, dissimilar to those of the previous mass protests against the 2009 ‘electoral coup’. Notably, the 2017 protests had neither leadership nor any immediate political demand, but a wholehearted political message was evident: the protesters rejected the Islamic Republic as a whole. Radical slogans, such as ‘death to Khamenei!’ (the Islamic Republic’s Supreme Leader) were chanted without hesitation. The protesters demonstrated absolute contempt for the Shia clerical establishment by chanting “people are paupers, while mullahs live like gods”. State-funded religious schools were attacked and set ablaze and about 60 offices of state-appointed Friday Imams were vandalized. Another curious feature of the 2017 protests was an adulation of the Pahlavi era. The tone of this esteem differed from one area to the other; most were nostalgic but some demanded the return of the monarchy. These chants were heard in the supposed heartlands of the Islamic Republic, the holy cities of Mashhad and Qom. Protesters in Mashhad shouted, “where there is no Shah, there is no order” and their compatriots in Qom echoed “oh Shah of Iran, come back to Iran”. Similar slogans were heard in Isfahan, and the city’s Friday Imam, allegedly, confessed that hearing praise of the Pahlavi dynasty was the most shocking thing to him. Montazeri’s opposition to the regime’s murderous propensity reached a breaking point after the mass execution of political prisoners in 1988. He was removed from office and lived in open opposition to the regime till the end of his life. Revisionism of the Pahlavi era steadily grew in the next two decades. In 2001, a favourable biography of the Shah’s longest serving Prime Minister, Amir-Abbas Hoveyda received license for publication. Written by Abbas Milani of Stanford University, the book has since been reprinted more than 40 times. Rehabilitation of the Pahlavi era further progressed when the hopes for Islamic Republic’s gradual metamorphosis into a Middle Eastern democracy were shattered by the events of 2009. After that episode, many Iranians came to believe that political engagement with the Islamic Republic was impossible. Based in London and founded by various corporate & political sources, Manoto began operation in 2010 and soon established a great viewership. Since 2009, BBC Persian and other satellite Persian TV Networks had shattered the Islamic Republic’s media monopoly inside Iran. But Manoto became a far greater challenge to Iran’s state media. Focusing on entertainment and popular programs, Manoto acted as an agent of alternative lifestyle to the one enforced by the Islamic Republic. Gradually, a savvy indirect shift towards politics began, which unrelentingly focused on producing Pahlavi Nostalgia. Through popular history programs and high-quality documentaries, Manoto judiciously highlighted the positive side of Pahlavi’s rule: a glamorous internationalist regime that built modern Iran and entertained the population with jovial events and broadcasts. Millions of Iranians compared this to the gloomy, intolerantly conservative and internationally isolated Islamic Republic and came to conclude that the revolution was a bad mistake. A large number of Iranian intelligentsia and political activists (particularly those who lived under the Shah and opposed his despotism) find this revival of monarchism insufferable. They dismiss it as a superficial nostalgia with no real political consequence. But, they wilfully ignore two major political developments: Four decades after it’s downfall, the Pahlavi dynasty has regained much of its’ prestige and legitimacy. And, from the moment the name of Pahlavi was invoked in 2017’s demonstrations; a vestige of a bygone era became a serious political player: Reza Pahlavi, eldest son of the Shah and heir to the Pahlavi throne. A citizen of the United State and head of a corporate entity, Reza Pahlavi has lived outside of Iran since he was 17 and has been a peripheral political entity through most of his life. His political fortune has always been determined by Iran’s internal developments and the foreign policy of the United States. Reza Pahlavi and other Iranian opposition groups gained some leverage from the clash over Iran’s nuclear program and President Bush’s regime change policy. This leverage was lost with Barak Obama’s presidency and despite volatile events of Iran’s 2009 elections; Reza Pahlavi’s political standing remained marginal. Even the presidency of Donald Trump could not change this, as siding with Trump’s boorish discourse could have had damaging backlash. It was Iran’s internal situation that transformed Reza Pahlavi’s fortunes. Even before Trump’s reimplementation of sanctions, the economic situation of most Iranians had dreadfully deteriorated. Their despair and hopelessness led to 2017’s protests and Reza Pahlavi’s political standing changed with a stroke. However, the restoration of the monarchy seems improbable, in no small part due to the uninspiring record of the claimant to the throne. 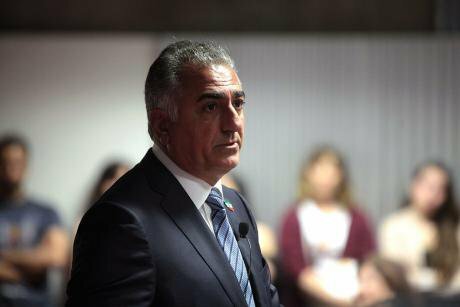 Reza Pahlavi has little charisma and his political career has been consistently mediocre. He seems to be his father’s son in one crucial negative respect. Mohammad Reza Shah had considerable political abilities and was an astute player in international affairs but often ineffective and indecisive when dealing with internal crises. Reza Pahlavi’s record suggests that he has inherited his father’s timidity. According to Amir-Asdollah Alam’s (the Shah’s most closest confidant) diaries, the Shah once remarked that his son was clever because he knew how to evade responsibility. This may explain why Reza Pahlavi proclaimed himself king in 1980 but retracted it later. A former friend, who fell out with him over financial disputes, claims that in the 1980s American intelligence approached Reza Pahlavi with a scheme to land a Pahlavi loyalist force in Kish Island under U.S naval and air support. Allegedly, Reza Pahlavi’s first question was about the exit strategy. None of this inspires confidence on Reza Pahlavi’s boldness and resolution. Furthermore, many Iranians do not relate with Pahlavi nostalgia. In the past two years, Iranian industrial workers and lorry drivers have been on constant strike and protests. There has been no pro-Pahlavi chanting from that corner. Iran’s various ethnicities such as Kurds, Azeri Turks and Arabs have little cause to be nostalgic about Pahlavi era, as they remember it for its’ Persian chauvinism and ethnic inequality. Nevertheless, the time was never riper for the cause of monarchism in Iran. The Islamic Republic is internationally isolated and overstretched in a proxy-war with its’ regional adversaries. The regime is facing fundamental economic crisis, which, although escalated by U.S sanctions, is mostly of its’ own making. The citizenry have lost all hope in political engagement within the Islamic Republic’s framework and the regime relies evermore on the ideologically loyal security and armed forces that receive the greatest chunk of the country’s budget. But this approach is becoming increasingly risky. According to ALCED, Iran had the world’s highest upsurge in protests during 2018. One Iranian parliament deputy recently warned that should the current situation continue, the regime would find itself paralyzed in the streets as the Soviet Union did. While protests inside Iran have dramatically increased, the Islamic Republic’s security apparatus has been continuously eliminated any potential unifying leader and organization, without which the protests will remain separated and easy to suppress. Outside of Iran, anti-Islamic Republic political activists are divided and impotent. The only serious opposition group is the People’s Mojahedin of Iran (MEK). MEK has organizational capability and a considerable lobby within the United States, including John Bolton and Rudy Giuliani. Founded as an urban guerrilla organization, resolutely fighting both the Shah and Khomeini, MEK once enjoyed a large following. But today, most Iranians hate MEK and Western governments are reluctant to openly engage with it because of its’ totalitarian nature and alliance with Saddam. All this benefits Reza Pahlavi, who (as said by Max Weber) possesses a traditional legitimacy in the form of the Pahlavi brand. Another factor in Reza Pahlavi’s favor is the fact that the most influential Persian satellite TV networks are either neutral or judiciously support him. Since the 2017 protests, Reza Pahlavi’s performance has exceeded expectations. In his lengthy conversation on Iran International (a Persian TV network rumored to be funded by Saudi Arabia), Reza Pahlavi seemed shrewd and earnest. He has prudently refrained from praising President Trump, while promoting himself as a unifying arbitrator for all dissident Iranians. While, the Islamic Republic’s standing plummets, Pahlavi’s Nostalgia continues to rise and so does the fortunes of Reza Pahlavi. However, the lady of fortune is capricious and quick to shun a favorite who has demonstrated him/herself without virtue and boldness. Reza Pahlavi’s momentum is the product of 40 years of the Islamic Republic’s failure and other factors beyond his control. If Reza Pahlavi fails to take advantage of his current momentum, he will learn that specters can fade as easily as they appear.